Captain Scott Cuthbert has handed the Hatters a real boost ahead of the busy Christmas schedule after it was revealed his injury isn’t as bad as first feared. 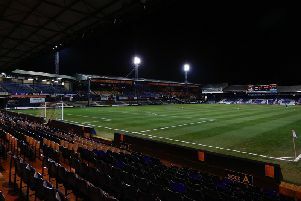 The 30-year-old was stretchered off during Town’s 7-0 win over Cambridge United recently, with boss Nathan Jones admitting he thought the centre half would be out until the new year. We won’t put an exact timescale on it, but it’s a lot better. However, that might not be the case now, as speaking in his press conference this afternoon, Jones said: “We’ve had a bit of good news for Scott, it won’t be as long as we first thought, so that’s a real positive. “We won’t put an exact timescale on it, but it’s a lot better. “We thought it was a tear in the abductor, that hasn’t been the case. “He’s torn more fibres really in and around the stomach area where he’s previously had like a hernia operation, so it’s good, he just needs those to settle down. “A lot of bruising has come out in an area we didn’t think it would so it shows the injury’s more there than elsewhere, so that’s a lesser timescale. Although backing his side to cope in Cuthbert’s absence, striker Danny Hylton knew it was a blow to miss without their skipper, as he said: “He’s having a great season, he’s our captain and leads by example. “It just shows though, he’s out injured and you’d think he’d be a big loss to us, but you’ve got an experienced centre half like John (Mullins) to come in. “He will be a big miss for us, but we’ve got players who can step in and we’ve got that all over the pitch, whoever it is.